(AINA) -- The majority of Coptic Christians and liberal Muslims in Egypt believe that Fundamentalist sheikhs and their mass media have played a vital role in the latest wave of incitement against the Coptic Church, orchestrated by Egyptian State Security. The Salafi (one who follows the ways of the first Muslims) television channels, airing their programs from Egypt, supported by their affiliated fundamentalist journalists and mosque imams, have engaged in a coordinated smear campaign against the Coptic Church and its Pope, designed to terrorize the Copts. Newspapers and TV channels in Arab countries gave a wide platform for Islamists to join in the campaign. It was on Al-Jezeerah TV Channel on September 15 that the Islamist and ex-secretary general of the International Union for Muslim Scholars, Dr. Selim Al-Awah, accused the Pope of running "a State within the Egyptian State" and the church of having its own militia and of hiding weapons and ammunition obtained from Israel in monasteries and churches, preparing for a war "against the Muslims," to divide Egypt and establish a so-called Coptic State. Al-Awah also accused the church of abducting and torturing Christian converts to Islam in monasteries, to brainwash them back to Christianity. He warned that if the status of the Church remains as such, the "country will burn" and called on Muslims to go out in demonstrations as the "only answer left to counteract the strength of the Church" (AINA 9-22-2010). Pope Shenouda expressed his concern about the smear campaign, he said in interviews with Egyptian state-owned channels end September "it is easy to incite the naive simple citizen, but the effects of these incitements are quite serious." He blamed the media and the instigators, who have an effect on the masses, causing hatred between Muslims and Christians and between the Church and the State. Salafi Sheikh Wagdy Ghoneim openly attacked the Pope, alleging the presence of weapons in monasteries and the Copts for fighting against the application of Sharia law in Egypt, calling on them to leave if they do not like it. He also attacked the Copts in the diaspora for siding with the Jews in the flotilla incident and for believing that should anything happen, the United States will come to save the Copts. He said "I swear by God, you will not have time stay alive until America and the West arrive, this is for your own good, if you understand. Do you think the Muslims inside Egypt will say thank you and may Allah give you health? No, by God" (video). Coptic political analyst Magdi Khalil said "No one cannot deny the effect of the Salafi mass media as they have a wide audience amounting to millions." He blamed them for fabricating events to incite Muslims against the Coptic Church. "They fabricated the alleged conversion to Islam of the priest's wife Camilia Shehata, which, despite her denial of ever wanting to convert to Islam and Al-Azhar's negation that she ever went there (AINA 9-18-2010), still draws demonstrations in front of mosques every Friday." The last demonstrations took place in Cairo and Alexandria simultaneously on Friday October 22, calling for Camilia's freedom from the prisons of the Church as well as other "Muslim sisters," calling for the boycott of Coptic businesses and insulting the Pope. The next and eleventh of these weekly demonstrations is scheduled for Friday October 28. Joining in the campaign against the church from London, is sheikh Haney el-Sebay, a convicted terrorist who sought political asylum in the UK and who runs the Almaqreze Center for Historical Studies there. He threatened the Copts in his speech and talked about the Coptic militias and the priest's wife Camilia Shehata. He added that Mubarak must have become a Christian as he acts against Muslim interests. On October 19, Egypt's main satellite operator Nilesat temporarily suspended 12 Islamic channels, and warned 20 others, on grounds of violating their licenses. The reasons given were mainly for promoting religious hatred, inciting sectarianism, violence, quack medicine and sorcery. "This decision was taken after extensive study that indicated a near doubling of these channels over the past year and a recent spike of extremist religious discourse," information minister Anas Al-Feki said in a statement. Before these measures were taken, there were 94 Islamic private television channels airing from Arab countries. Nine of the twelve suspended channels were funded by Saudi Arabia. "There is no doubt that Saudi Arabia is playing a destructive and ruinous role in Egypt," commented Magdi Khalil. Analysts said that the suspension decision seemed to be mainly aimed at stopping the spread of strict Islamic Salafi/Wahabbi teaching that might boost support for the Muslim Brotherhood, prompted by the forthcoming crucial parliamentary elections in November. Several angry Islamists came out attacking the government over this decision, and exposing the complicity of State Security with the satellite operators. 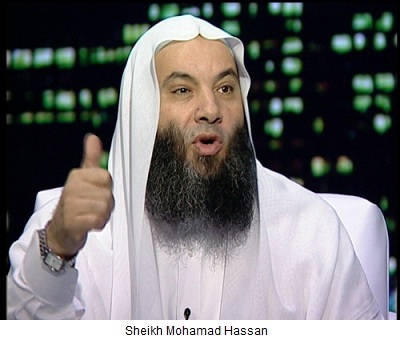 Sheikh Safwat Hegazi, a preacher in El-Nass, one of the suspended salafi TV channels and member of the Muslim Brotherhood, told State Security that if the channel is not opened soon, they will air from outside Egypt. He added, "then Egyptian security will not have any control over us or be able to guide us." He pointed out that in the coming period the suspended channels will re-open and will be owned by the sheikh. Mamdouh Ismail, a lawyer for Islamist groups, said that the closure of the religious satellite channels was a gift to the church to ensure its support in the elections. He said that Security imposes on the preachers conditions in case they appear on the satellite channels, such as not to criticize the policy of the state, otherwise they could face expulsion from the channel. Khalil disagrees that anything was done for the sake of the church, "When they were attacking the Copts, no one moved. However, when some of the channels became a political threat and crossed the red line drawn by State Security, which is not to attack the government, they were suspended." He added that some of the sheikhs in the suspended channels started calling on Muslims not to vote for Mubarak's ruling National Democratic Party "as they hand over your Muslim sisters to the church". According to Khalil extremist on these channels have been calling for years for the murder of Copts, issued fatwas for the permissibility of Muslims purloining Coptic property and money, accusing them of treason and being agents of foreign powers, and of being unbelievers and idolaters, ridiculing their Holy Books and their beliefs, calling for their Islamization either peacefully, by deception or by humiliation, inciting the State against them, calling for the torching of their churches and inciting against their women. It was reported that one of the most fundamentalist of the suspended TV channels, "Al-Hekma," owned by Sheikh Mohamad Hassan, will appear soon on Lebanese-owned "Nour Sat" after changing its name to "El Rodah." Commenting on the ongoing smear campaign and demonstrations against the Church, Coptic activist Mark Ebeid said "These allegations are extremely serious. They run on the same lines used by the Ottoman Empire as an excuse for the 1915-1923 Armenian and Assyrian Genocide in Turkey."